I’ve found that there isn’t really time (or more accurately — energy) to write these Internet logs when one is fully employed. Thus the the numerous internet fields I sowed sowed in the past have been left untended and barren. I bit like the communist remnants of Statue Park in Budapest. If you’ve been following Waffle Group closely, I left you on a bit of a cliff-hanger with the last post. What a long time to dangle out there? Your arm must be aching terribly! So sorry. I did, in the end, make it to the top. There is a lovely view from up here. Beautiful country roads that tunnel through overhanging tree branches, leading past rolling farmlands to the coast. It’s windy down there on the beaches, but I’m told the air calms down in the summer months making the beach perfect for an influx of tourists. 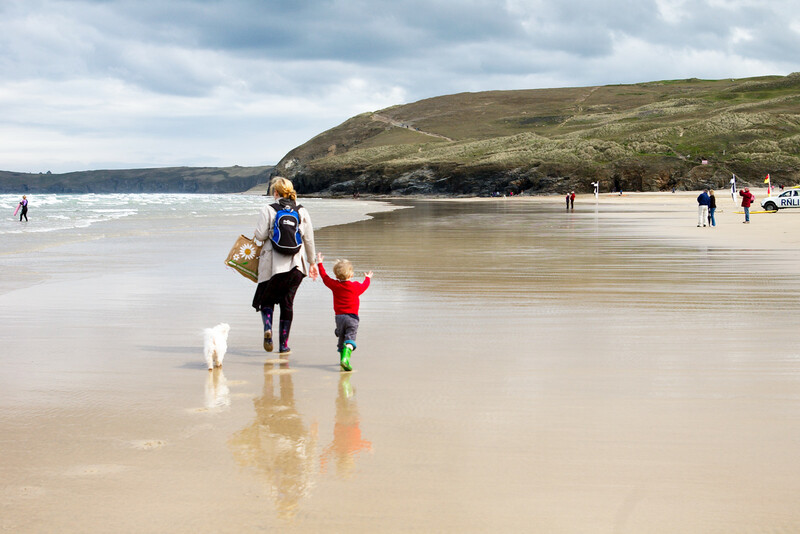 Seaside walks along craggy cliffs are an option. ‘Rambling’ is what they call it around here. Bean Dog has certainly been impressed with the potential of the place. We took her to Perranporth beach and she couldn’t decide whether to dig a hole, manically run in a circle, or chase a tennis ball — so she opted to cycle between the three, switching from one activity to the next every 30 seconds. A fair summary is that I think Cornwall is a kickass place to live. It has less temperamental weather than Scotland has, and it generally warmer. There are similarities too. The Scots rather enjoy waving about their blue and white flag, and beating the drum of Scottish pride and nationalism. The Cornish have a black and white flag to wave about and appear to be similarly keen on their unique identity. The best thing about Cornwall is that I have a professional job here. The rest of the UK misses that key ingredient to self-sufficiency, and so Cornwall could be an environmental wasteland devastated by years of unrehabilitated mining activities and tailings dams, and I’d still think it was the most magical place on Earth. My new employer has offices in the with a breath-taking view of a mine tailings facility used to store precipitated acid rock drainage from historic underground mine workings. A fitting location for a mining engineering and environmental consultancy. I don’t intend to say too much about work here, except that I am extremely happy and really enjoying the company, the people I work with, and the job itself. If you do want to know more about my work-related things (environmental management, environmental science, mining practice and stuff along those lines), such writing may appear at Pragmatic Hippie. There is not much there now, so no surging ahead in your effort for dull soothing reading. (As an aside — if you cannot contain your need for tedium, the Dull Men’s Club might be just what you need). Cornwall would be less lovely if I only had a job here, but my family were elsewhere. This was kind of the case when I first arrived here. I rushed off to Cornwall to get stuck into the job, while Angie packed up our old place in Scotland, arranged for the move, looked after Jethro, looked after Bean, performed circus tricks and generally displayed superhuman characteristics. I eventually managed to find a place for us to live. Angie travelled down by train with Jethro and Bean. A ten hour journey. Miraculous no-one was thrown from the train in frustration during the trip. No sure how Angie managed it. Then our stuff arrived at the house. It would never have made it on to the truck had our magnificent friends Jude and Andy not been there to coordinate things in Scotland. You guys rock! The dust of the move has mostly settled, but we are still left with no cupboards in the house (or at least very few), although we did buy a lawnmower. It’s about keeping up appearances. As long as we keep people out of the house, they can’t really see how the clothes are all piled in stacks. Long grass at the front of the house is less easy to hide without blinding all of the neighbours. And although a recently blinded neighbour is unlikely to complain about an unkempt garden, they will probably call the police which will just attract more attention and more people requiring blinding. In the end it just seemed like less work to cut the damn grass. We have the essentials, but we still lack friends, and this is something that is hitting Angie particularly hard. I have people to interact with at work, but she would really like a little more conversation with other adults. We’re working on it and know we’ll get there eventually — it just takes time. Jethro starts school this year in September. Due to the awkward timing, it’s a little pointless signing him up at a nursery, so Angie has been trying to find interesting extra-mural activities to keep him busy and herself sane. Swimming and French lessons have commenced. I can say that I’ve learned more French from Jethro’s age 3-4 French than I ever did during my disastrous attempt to study French at university. And here ends the lengthy general update thing. The next one might be a long time coming, so if you want Internet update-type things from me it might be best to find me on Google+. The Book with the Faces is not to my liking. I don’t really get the Short Shrill Bird Noise, although I do occasionally make sub-140 character droppings. Frankly, there are so many of these damned social network things that it makes my brain rattle inside my skull, and my eyeballs pulsate. I decided I have to choose one of these things, and I’m choosing the one that almost no-one I know uses. How very anti-social-network of me. I’m certain some of my readers understand. Most cunning, that little Cornish spot you have located! We must come visit soon, and perhaps take a ramble or two. Rambling in Joburg is not advised due to the ongoing likelihood of becoming either (a) roadkill, (b) mugged, or (c) trapped in a shopping mall. And no fear re: social networks; I quote-unquote get you on that one. I don’t think you’re quite as frothing a misanthropist as I am when it comes to that sort of garbage, but I certainly concur wholeheartedly with the “choose one and ignore the others” sentiment.